It has been used by customer in 100 countries since 1999. Matured product with time proven performance around the world and in Malaysia. 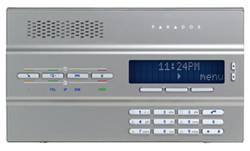 Each threats and responses are well thought and carefully designed into the alarm panel. They devoted years of intensive research developing the most easy-to-use alarm system that can effectively protect millions of family and business around the world. PARADOX do not just perform sampling or batch testing — they test the entire mass production to guarantee exceptional consistent quality on every single equipment that they produce. . Reliability isn’t just a word at Paradox, it’s a philosophy. PARADOX equipments are certified by international body UL, C-UL, CE, FCC, and California State Fire Marshall - another recognition of its rock solid quality. Paradox alarm protects itself from external damage. Fuseless technology will auto shutdown the panel when it detect high power surge possibly from lightning strike or intentional sabotage by intruder. It provides protection for two independent partition area at the same location. Maid can disarm the maid’s room, kitchen and dining area (first partition) to do house chores early in the morning while the whole house perimeter (second partition) still armed and protected. Paradox provide the flexibility to maximize your protection,. Every zone input is protected against electric surge caused by small to medium lightning strike. Paradox is the first company to release the groundbreaking line of 100% digital motion detectors. What digital means to you is stable, precise and reliable protection, with a vast reduction in false alarm. Intruder doesn’t stand a chance against digital detection. The security of your loved ones and your business depends on the choice you make. Invest wisely. Give them a world class alarm protection that they deserve. "PARADOX is the brand of confidence and protection you can trust." Simultaneous Five-channel Reporting Offers reporting via GPRS, GSM, SMS, Voice, and traditional landline, with pre-defined communication sequences to save installation time.